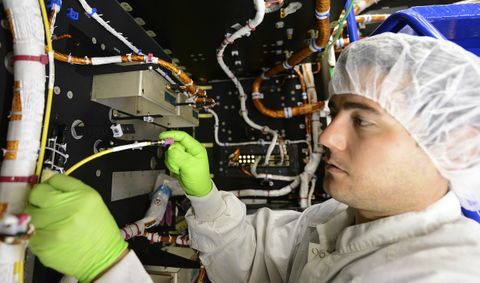 REDONDO BEACH, Calif. â June 13, 2013 â Northrop Grumman Corp (NYSE:NOC) recently delivered the first of approximately 20 electronics units for the fourth Advanced Extremely High Frequency (AEHF) satellite payload, allowing the integration and test phase of production to get under way. AEHF, the next generation of protected military communications satellites, provides vastly improved global, survivable, highly secure, protected communications for strategic command and tactical warfighters operating on ground, sea and air platforms. The system also serves international partners including Canada, the Netherlands and the United Kingdom. Delivery of the uplink phased array high-efficiency converter (UHEC) means that testing of the uplink phased array subsystem can begin later this year. Each UHEC operates the uplink phased array antennas on each payload and their "first-ever" technologies developed specifically for AEHF, said Stuart Linsky, vice president, communications programs, Northrop Grumman Aerospace Systems. The UHEC delivery paved the way for payload integration and testing, which began May 1, two months earlier than baseline planning requires. All electronics units will be integrated onto AEHF-4's payload module, which was delivered ahead of schedule last November by AEHF prime contractor Lockheed Martin Space Systems, Sunnyvale, Calif. Northrop Grumman is the AEHF satellite payload provider. "Delivery of the UHEC was ahead of schedule as we applied lessons learned from the early delivery of the first three AEHF payloads we built," Linsky said. "We plan to follow this first early unit delivery with more early deliveries to achieve the government's affordability expectations." When completed, the fully integrated payload module will be shipped to Lockheed Martin's Sunnyvale facility for final satellite integration and test. Uplink phased array antennas, which receive signals from ground terminals, direct radio frequency beams electronically rather than by moving reflectors mechanically. This allows one array to do the job of many reflectors, giving the flexibility to point on demand in fractions of a second, greatly improving warfighter access. It is also the first phased array for space application that operates at 44GHz. The highly directional antenna additionally reduces the possibility of jamming and intercept by enemies, ensuring secure, reliable communications between command and control units wherever they operate. Northrop Grumman has provided sophisticated and robust protected satellite communications payloads with increasing, highly secure connectivity to U.S. military forces for nearly 30 years. As the only company with this capability, Northrop Grumman delivers survivable communications that help achieve information superiority.